Location, Location! 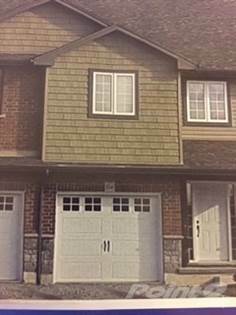 Trendy Port Dover Brand New, 3 Bdrm, 2 1/2 Bath, Freehold, Exec. Home, directly across from and with views of Lake Erie from the 2nd Fl. Rare opportunity as there are only 4 of the 7 Towns left. Situated on a quiet Cul-De-Sac with a green-space, park-like setting in the back. Extra large Master Bdrm with W/I Closet and Ensuite as well as a 2nd Fl Laundry for your convenience. Main Floor Foyer opens to the 2nd Floor. Features approximately 2000 Sq Ft of living space with a built-in garage. There's still time to choose your finishes if you purchase now!! Ideal for the single executive, young seniors that are downsizing or the busy professional family who deserves a great urban residence. BOER Homes, known for their excellent quality and craftsmanship, are nominated for TARION's 2019 Ernest Assaly Award! Only 81 out of 5000 registered new home builders in Ontario have met TARION's rigorous eligibility criteria for this award. HST is included in the purchase price and TARION's warranty Program Fee is paid by the builder. Measurements are approximate. New Build, therefore Taxes are not yet assessed. ACCESS BY PERMISSION ONLY. Aside from this home, #'s 133 and 129 Brown Street are the only ones left, as #'s 127, 131, 135 and 139 have SOLD. The value of these homes are exceptional and because of the location, square footage, quality of workmanship and the Builder's reputation I truly believe these won't last long. YOU STILL HAVE TIME TO PICK YOUR OWN FINISHES! 1) Accross the street from Lake Erie, 2) cul-de-sac and 3) green space behind each home. Hi, I'd like to find out more information about 137 Brown Street, Port Dover, Ontario. Thanks so much!